Coats Zeta thread is made of extremely-macromolecular polyethylene (SVMPE) and is the only commercially available thread in the world containing gel, and being at the same time the self-greased thread. Thread is produced from raw materials of new generation which are used only for production of the products used in the space and military sphere. Coats Zeta thread is very wearproof, strong and extremely light thread. These technical characteristics do Coats Zeta Thread ideal for production of a number of industrial goods. The main scopes - the space industry, airships and parachutes, sails of boats, bullet-proof vests and overalls, strong footwear, gloves and filters. 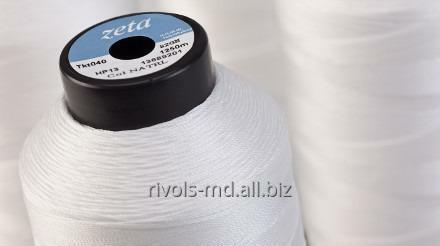 Costs Zeta thread is very wearproof, strong and extremely light thread. These technical characteristics do Coats Zeta Thread ideal for production of a number of industrial goods. Coats Zeta thread has the exclusive durability and rigidity. At compliance of the sizes of threads Coats Zeta thread by 10 times and 40% stronger, than high-quality steel and aramids respectively. Coats Atlantis is made of liquid crystal polymer - the raw materials of the new generation which is usually used in space and military production and conforming to the highest requirements to quality. Coats Helios P is the hi-tech sewing thread executed from 100 politetraftoretilen (PTFE), having magnificent resistance to chemical influence and influence of UF of beams. Coats Nylbond is the bondirovanny nylon thread made of previously stabilized complex Nylon 6.6, providing magnificent wear resistance of seams in a product. Unbelievable price on Thread from extremely-macromolecular Coats Zeta polyethylene in Chişinău (Moldova) company Rivols, SRL.